Gemco Construction Ltd. was established in 1986 as a land development and municipal infrastructure contractor. We are still focused on these sectors, while expanding our reach to the private sector, industrial, institutional and commercial developments. With our experienced and well-trained team, company-owned fleet of heavy equipment, and quality oriented sub-trades and suppliers, we have constructed nearly 600 projects since our founding in 1986. Many of our project site managers have over 25 years of experience in civil construction. They have a proven record of meeting budgets and deadlines, which has Gemco on the preferred bidders list of many prominent land developers and municipalities. Services we provide include site preparation and excavation, installation of underground utilities (such as sewer, water, electrical and telecommunications), roadworks, retaining walls, environmental construction, erosion and sediment control systems. 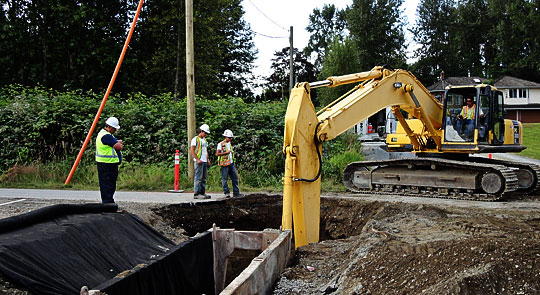 Gemco is committed to the highest standard of roadwork in the Lower Mainland. We focus on providing unparalleled value through the quality and durability of our craft that has been established through decades of experience. Integrity High ethical standards to be a trusted provider of quality service. Quality Quality construction services for site preparation and land development projects. Expertise Team with the skills and capabilities to provide top-level industry service to all our clients. Honesty Our employees provide ethical, honest and effective solutions to all our clients. Our people are our greatest asset, working together to create a safe, supportive and successful work environment. At Gemco, we provide quality workmanship, ethical standards and effective solutions to all of our clients. We are interested in employing individuals who share these values and strive for safety in the workplace. Are you eager to learn and grow with the Gemco team? We offer competitive remuneration and a comprehensive benefits package. Apply for an open position or let us know if you want us to keep you in mind for future consideration.